HOPE, AR—Saying all public appearances would be canceled until they could find a way to free the former Arkansas governor, officials announced Friday that Mike Huckabee’s presidential campaign had been suspended due to the Republican candidate becoming trapped in a briar patch. “Aw shucks, we hate having to put everything on hold like this, but darned if Mike ain’t done got hisself stuck in a dang briar patch like a possum in a drainpipe,” said senior advisor Chip Saltsman, adding that the GOP hopeful had been “kickin’ up a ruckus” and “hootin’ and a-hollerin’ something fierce” since becoming entangled in the thicket earlier in the day. “I told him not to go chasin’ after varmints in the yard or he was liable to end up in the prickly bush, but that’s ol’ Mike for ya. 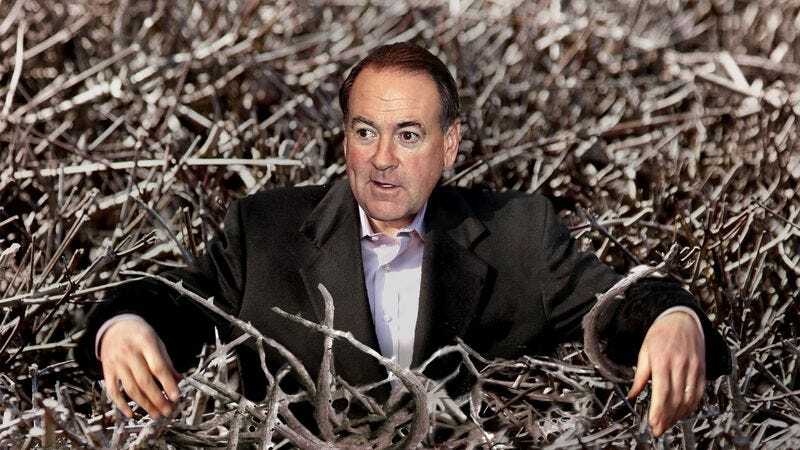 I reckon I oughta tell the rest of the folks on staff that we won’t be making it to the rally over yonder in Iowa City tomorrow.” At press time, aides had reportedly managed to free Huckabee from the briar patch only for the Republican candidate to go tumbling face-first into a crick.